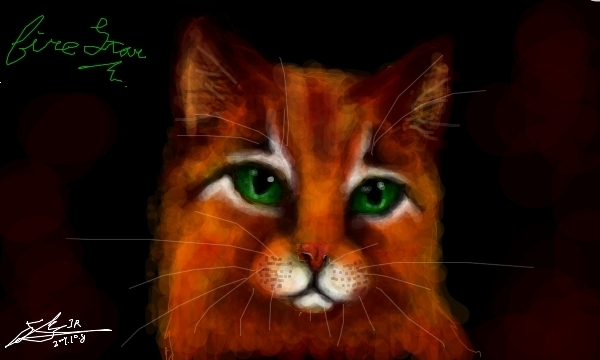 Firestar. Done on sketchfu -. Wallpaper and background images in the Warriors (Novel Series) club tagged: firestar. This Warriors (Novel Series) fan art might contain बिल्ली का बच्चा, किटी, किट्टी, बिल्ली, सच्चे बिल्ली, सच बिल्ली, टॉम, बिलाव, and टॉमकैट. wow thats pretty! were did you learn to draw like that? Perfect, it's just perfect! If Erin Hunter saw you now, she'd probably let you design the front cover of her books! wow !!!!!!! It's perfect!! I love Firestar !!!!!!!!!!!!!!!!!!!!!!! Wow . . . I cant explain what I see in front of my eyes in any other word other than ,Beautiful. You see the real firestar when you look at that picture. Firestar look kinda sad, and looks plumper than the average wild, feral Clan cat, but apart from that, it's cool and cute. And I'm not a huge fan of Firestar, I can tell ya' that.